Well-known to *nix-users, unknown to most Windows-users. A file or folder can exist in more than one place, meaning the file is stored once to disk, but can have two different names on different locations. If you change it one place the change happens to the other place. I won’t bother going into details, but in short NTFS supports a few different ways to do this. New in Windows Vista and Windows 7 is “NTFS Symlinks” which is a powerful way of linking files and directories between filesystems and over network in addition to the usual duality. Dropbox is a great tool for synchronizing small amounts of files between computers (<2GB free). 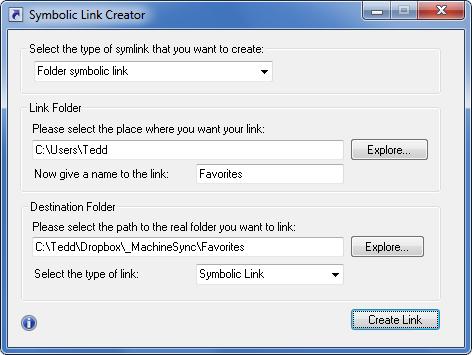 This application gives you a simple to use GUI for creating symlinks. Dropbox does a great job in synchronizing the dropbox folder, but it requires you to actively put files there. This is fine for all the stuff you can choose, but there are a few scenarious where you can’t do that easily. In the picture above I have created a “_MachineSync” folder that contains a Favorites folder. By deleting my Favorites-folder in my user profile and linking in the Dropbox Favorite-folder all my IE favorites is synchronized to Dropbox. I’ve done the same on both my work PC and home PC, so now favorite items are instantly synced between home and work PC (as well as being accessible via web). The same could be done with my documents, Desktop or anything else I’d like to keep in Dropbox. Just note that some folders require you to log on as a different user to be able to delete them before symlinking them in from Dropbox.